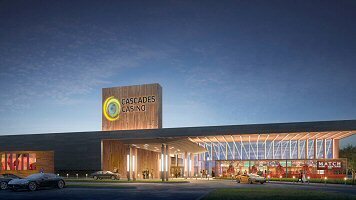 Cascades Chatham Casino aims for grand opening on Canada Day. It’s not often that a major, multi-million-dollar construction job is able to finish ahead of schedule – least of all a full month and a half ahead of schedule. But that’s exactly what the pit crew is hoping for at the new Chatham, Ontario casino site. According to the construction job’s crew manager and the CEO of Gateway Casinos & Entertainment, the company in charge of building the new gambling facility, the people of Chatham-Kent may have twice the celebration in store come July 1. It’s not just Canada Day, it’s the date Gateway is hoping to be able to host its grand opening. Gateway Casinos Chief Executive Tony Santo and Robert Principe, Project Manager for BTL Construction, the firm contracted to build the $36 million, 45,000 square foot entertainment facility, welcomed members of the Chatham-Kent City Council and the press to take a tour of the construction site on Tuesday, February 5. Santo praised city officials for their diligent role in expediting the project; a key factor in their ability to stay ahead of schedule. He notes the swift and decisive actions of councilors in helping to plot out the casino, choose its final destination, and provide the necessary permits to get the ball rolling. “We’re really excited and anxious to get the property open,” said Santo. 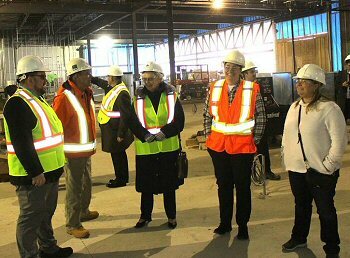 He wasn’t the only one to share that sentiment, as was evident by the smiling faces of Councilors Anthony Ceccacci, Amy Finn, Karen Kirkwood-Whyte, and Jamie McGrail, as they spoke with BTL Construction Site Manager Roman Koval during the tour (image right). The exterior is nearly complete, awaiting the installment of glass windows and other finishing touches. From there, Principe says the final interior stages will begin mid-March—a full month ahead of schedule. The final stage is projected to last 4 months, but if things continue to run so smoothly, it could easily wrap up in three and a half months. None were more pleased by the progress and praise than Mayor Darrin Canniff. “It really makes a statement that Chatham-Kent’s open for business,” he said. As for the sentiment of local residents, Mayor Canniff knows that some people are concerned about having a large casino operating in their neighborhood. However, he says he’s been hearing mostly positive feedback from the community as the project comes together. Once complete, the Cascades Chatham Casino will feature 333 slot machines, 12 table games, and 2 signature restaurants; the MATCH Eatery & Public House and The Buffet.